After enduring three presidential debates and the unceasing political chatter on social media, most Americans are probably looking forward to the election ending, regardless of the results. Fortunately, third-quarter earnings season is also in full swing, providing a welcome distraction from politics as usual—and plenty of information to digest while updating the comments and ratings for the more than 200 essential-service stocks covered in our Utility Report Card. But utility investors can’t afford to ignore elections, particularly the gubernatorial races. Regulators set the rate of return that utilities can earn on their capital expenditures; shifts in the make-up of public utility commissions can exert a meaningful influence on a company’s growth prospects. The November issue of Conrad’s Utility Investor will analyze the implications of federal and state elections for electric, gas and water utilities as well as pipeline operators and telecom companies. Here’s a preview of some of the opportunities that could emerge in the aftermath of the election. Eight years ago, many investors assumed that the election of Barack Obama would spell doom for the stock market, especially for the health care, financial and utility sectors. However, the S&P 500 embarked on an impressive bull run over the course of Obama’s two-term presidency, and the sectors that investors thought would bear the brunt of excessive regulation and policy changes outperformed. The MAC Global Solar Power Index, on the other hand, gave up more than 70 percent of its value over this period, despite many pundits touting renewable energy as a big winner from an Obama presidency. Past elections furnish plenty of examples of why investors should forget politics and focus on industry- and company-specific fundamentals when deciding how to allocate capital. Ignore shortsighted articles about so-called Clinton or Trump portfolios. What would a Hillary Clinton victory in the upcoming presidential election mean for the more than 200 essential-service stocks that we cover in Conrad’s Utility Investor? If Hillary Clinton wins the presidential election, Democrats would maintain their 3-2 majority on the Federal Energy Regulatory Commission (FERC), Federal Communications Commission (FCC) and Nuclear Regulatory Commission. Their appointees will also set the policy for the US Dept of Justice’s antitrust division and the Environmental Protection Agency (EPA). Expect a Clinton administration to continue many of the policies established during Obama’s eight years in office. However, any policies that require spending will need to be worked out with Congressional Republicans. These realities suggest that investors shouldn’t assume that a Democratic victory in the presidential election will result in, say, aggressive subsidies for rooftop solar power. A Clinton administration could push for federal rules governing hydraulic fracturing, a controversial practice that has contributed to the shale oil and gas revolution. Such a move could increase drilling costs, but would also reduce the risk of outright bans in individual states. Regulation of emissions from coal-fired power plants would likely intensify during a Clinton presidency, resulting in the retirement of older facilities and accelerating the transition to natural gas. Donald Trump has vowed to approve the cross-border segment of TransCanada Corp’s (TSX: TRP, NYSE: TRP) Keystone XL pipeline and presumably would support the Dakota Access pipeline. The Republican presidential candidate’s appointees could also significantly change policies at FERC and follow through with Congressional Republicans’ goal of abandoning the FCC’s push for net neutrality. Curtailing the EPA’s enforcement of Clean Air and Clean Water Acts or even withdrawing from international agreements to limit emissions of carbon dioxide and other pollutants would likely land the administration in court. Regardless of who wins this year’s presidential election, natural gas will remain the fuel of choice for power generation and heating, in part because of environmental regulations but also because of its abundance and cost advantage relative to coal. In other words, economics and market factors raise serious questions about Trump’s promises to revive the coal industry. State mandates to increase the proportion of renewable sources in the energy mix will also remain in place. Given the bipartisan support for the legislation that last year extended federal tax credits for wind and solar power, President Trump might also encounter challenges if he tried to end these subsidies. Bottom Line: Although Trump and Clinton have laid out different visions for energy, water and telecommunications, neither candidate will shake up the existing trends in these industries. An extreme reaction in the stock market to the outcome of the federal election could create a buying opportunity for patient investors. Financial media outlets usually focus on analyzing the federal elections, as opposed to results at the state level. But this time around, the national media has focused on a Nevada ballot initiative that would repeal the fixed fees that owners of rooftop solar-power units must pay for grid maintenance and a constitutional amendment that would change how the state regulates electric utilities. If Nevada voters overturn the fixed fees levied on rooftop solar-power units, expect similar initiatives to emerge in Arizona, where the industry abandoned a ballot measure in favor of direct negotiations with Pinnacle West Capital Corp (NYSE: PNW) and other incumbent utilities. But if the initiative fails, other states may join Hawaii and Nevada in changing the rules to benefit utilities at the expense of residential rooftop solar power—yet another headwind for SolarCity Corp (NSDQ: SCTY), a company that loses more money with each incremental sale. 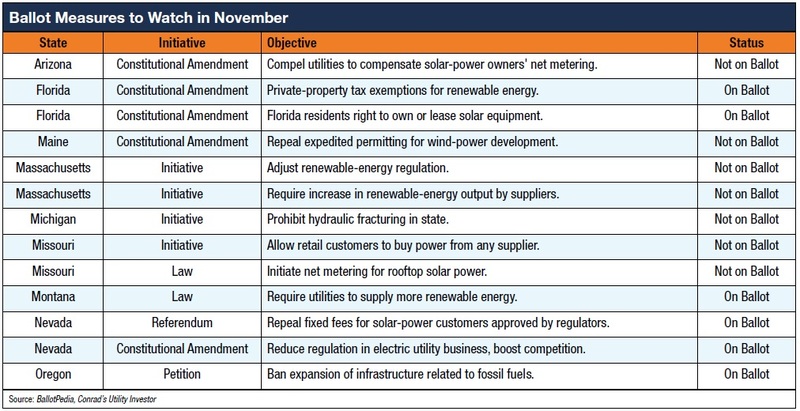 The remainder of the ballot initiatives on our radar haven’t gained much traction in the national media, though their approval could have important implications for utilities. Gubernatorial elections can change the make-up of public utility commissions, potentially changing the regulatory climate in the state. The Cook Political Report recently rated the gubernatorial elections in Indiana, Missouri, New Hampshire, North Carolina, Vermont and West Virginia as toss-ups. Of course, a change in which party controls the governor’s mansion doesn’t guarantee that the regulatory environment will improve or deteriorate. However, investors should stay on their toes. Indiana and North Carolina are two states to watch closely because of the odds that a different party could win the governor’s mansion. Relations between regulators and utilities have been salutary in both states, but political change can set the stage for a shift in utility-regulator relations. In Indiana, polls indicate that Democrat John Gregg has built a lead over Republican candidate Eric Holcomb. Meanwhile, Gov. Pat McCrory appears to be running neck and neck with Democrat Roy Cooper. As with the 2014 election cycle, the November issue of Conrad’s Utility Investor will cover everything you need to know from this year’s results at the state and federal level. Now is the best possible time to subscribe to Conrad’s Utility Investor. I’ll host my next Online Chat on Nov. 17, when subscribers can ask me anything that might be on your mind about investing or utility stocks. You’ll also get my exclusive takeaways and best ideas from two days of conversations with management teams and institutional investors at the Edison Electric Institute’s annual financial conference. You won’t find this on-the-ground intelligence in any other newsletter. My top five picks from last year’s conference have generated an average total return of about 35 percent, compared with the Dow Jones Utilities Average’s 21 percent return and a 5 percent loss for the five stocks I highlighted as must Sells. 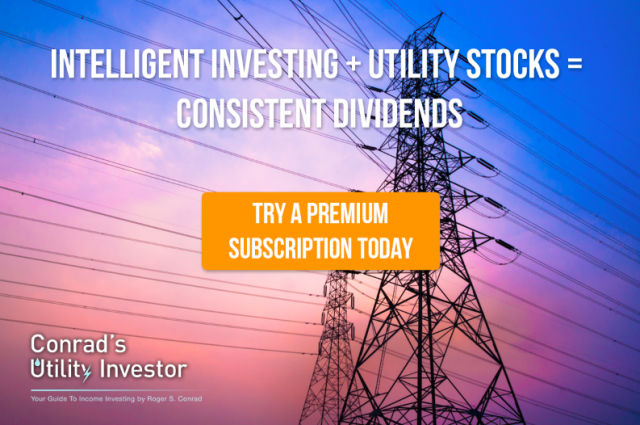 Subscribe to Conrad’s Utility Investor today to make sure that you have access to all my latest insights, analysis and investment ideas.